Google even shows up in places you’d never expect it to. For example, you know those “captchas” that websites and online forums use to verify that you’re human? Google bought reCAPTCHA in 2009 and is currently using the captcha input from hundreds of millions of users to improve its text recognition software. But that’s just a tiny little service. Let’s see where Google has a more dominant presence, starting with, but not ending with, search. That Google is the King of Search isn’t a surprise. That’s what they’re known for. But just look at how dominant they are. 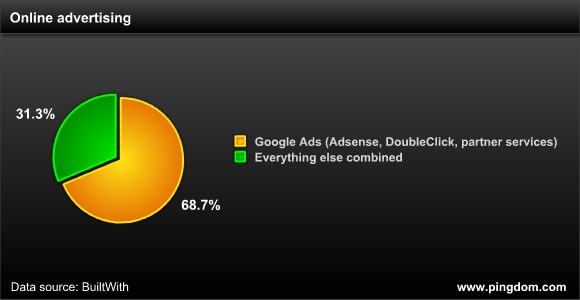 Aside from being a search giant, it’s widely known that Google makes the vast majority of its money on ads. It’s been a golden goose for the company ever since they came up with Adwords and Adsense, and makes up 97% of its revenue. That’s not so strange, when you consider that Google also serves ads on a huge number of websites in addition to its own very large web properties. Google actually serves ads on more websites than any other company. We couldn’t find stats for mobile ads, but from what we understand, Google is at the top there as well, especially after buying AdMob last year. Google’s video site, YouTube, isn’t just the biggest video site on the Web, its videos are also the most frequently included on other sites, for example embedded in blogs. Feedburner is used by a ton of blogs for publishing RSS feeds, and Google Reader is the most widely used feed reader service available. 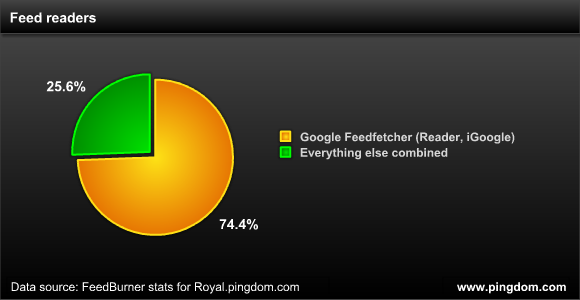 We didn’t have exact stats for Google Reader, so in this case we settled for stats from our own blog. 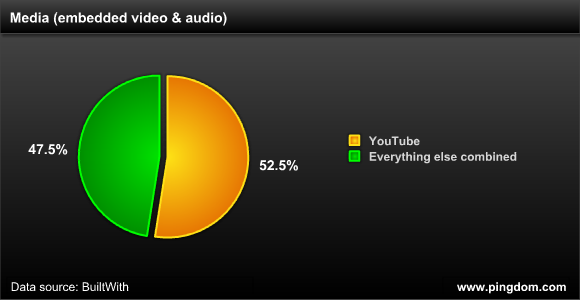 There will be some variations from blog to blog, but the overall ratio should be similar. The examples so far were just some of the more known examples. Google has a very strong presence in a variety of other fields as well. Mobile phones. Android, as a mobile OS, is growing fast and is reportedly catching up to iPhone and Blackberry. Web browsing. Google Chrome is currently the third-largest web browser in the world, and its market share is increasing faster than any other browser. Chrome has tripled its market share in the last year. Email. Gmail is one of the very largest email services out there, in competition with Hotmail and Yahoo Mail. Office applications. Although perhaps not yet in a position to threaten its desktop counterparts, Google Docs is a very usable and popular office suite. Blogging. It’s not as dominant as it was in its heyday and under attack by services like WordPress.com (and self-hosted WordPress blogs), but Blogger is still one of the largest blogging services in the world. Maps. Google Maps is the most popular maps application on the Web and is used by a huge number of mashups and applications, and provides mapping functions for iPhone, Android, and more. 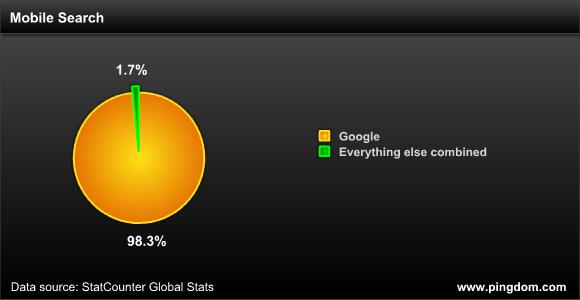 Google’s Map API is the most popular web API out there in terms of adoption and usage. Operating systems. Aside from the already successful Android, Google also has the Chrome OS project that is being released this fall. It remains to be seen how successful it will be, but it certainly has potential. DNS. Google has already launched support for people to use their DNS servers instead of that of their ISP. It’s not unthinkable that Google will expand its Google Public DNS offerings down the line, competing more directly with services like OpenDNS. Social. There’s the possibility that Google may some day be really successful in social media, the one section right now where they can’t really seem to get a good grip on the market. Orkut, while very popular in some regions (primarily Brazil), hasn’t had quite the worldwide success Google would have wished, and Google Buzz has more or less flopped. Television. 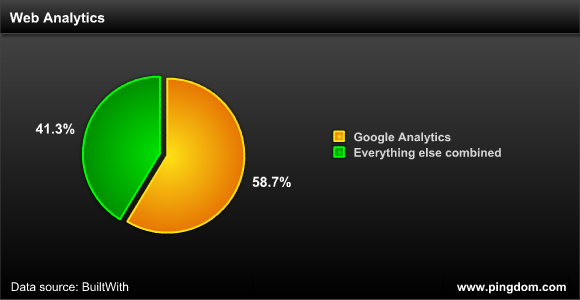 There’s been a lot of talk about the forthcoming Google TV. We’ll see where that leads. Our list here is far from complete, but you get the idea. The exact numbers in this article really aren’t the point. 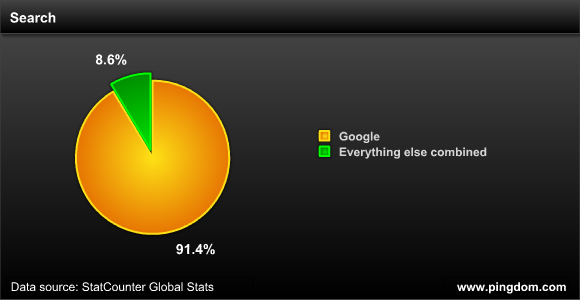 The point is that Google has an enormous presence on the Web and the Internet. Google is far from being just a search company anymore. It’s become an ad-funded Internet leviathan. Impressive, isn’t it? ONE SINGLE COMPANY with such a dominating presence in so many areas online. It’s not hard to see why people sometimes joke that Google IS the Internet. Data sources: Google, BuiltWith, StatCounter and Wikipedia. What amazes me is the Google Earth and SketchUp. SketchUp is so easy 3D designing tool. Google Earth is just awesome. and they created Google Earth into actual 3D earth down to a building. And Google isn’t making all that 3D models. I was not aware that reCAPTCHA was from Google now. Its good and sad at the same time. It seems Google does buy everything that works on the Internet. I suppose Pingdom is waiting to be bought as well with their GIGRIB service right? Kinda agree that Google is the king but they got there by producing the best search engine and then monetizing it effectively. They didn’t use Microsoft’s tricks of underhand tactics to demolish competition and I’ve not seen any evidence of them using their dominance to squash competitors. However I don’t think there is much need for any anti-trust on anything other than search and given its a free service its not really applicable there either. People simply use it because its the best, if they start manipulating the results it will naturally lose it’s dominance. I’d much rather see anti-trust enforcement in the OS market which Microsoft and dominated and screwed over (deliberately) anyone not using Windows as much as they possibly could. But I do see some failed products from this giant too..Like Google Wave..Buzz..Orkut failed to Facebook, Picasa to FLickr etc. But the success is too high!